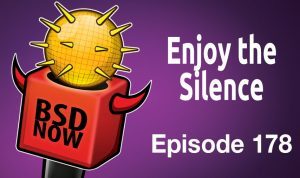 We discuss a wide variety of topics including Routers, Run-Controls, the “Rule” of silence and some Minecraft just for good measure. Stay tuned for your place to B…SD! This is to prevent shooting yourself in the food, as the compatibility code for those older OSes has been removed now that they are no longer supported. If you use pkg, you will also run into problems on old releases. Packages are always built on the oldest supported release in a branch. Until recently, this meant packages for 10.1, 10.2, and 10.3 were compiled on 10.1. Now that 10.1 and 10.2 are EOL, packages for 10.x are compiled on 10.3. This matters because 10.3 supports the new openat() and various other *at() functions used by capsicum. Now that pkg and packages are built on a version that supports this new feature, they will not run on systems that do not support it. So pkg will exit with an error as soon as it tries to open a file. You can work around this temporarily by using the pkg-static command, but you should upgrade to a supported release immediately. With TrueOS moving to a rolling-release model, we’ve decided to be a bit more proactive in sharing news about new features that are landing. OpenRC is a dependency-based init system working with the system provided init program. It is used with several Linux distributions, including Gentoo and Alpine Linux. However, OpenRC was created by the NetBSD developer Roy Marples in one of those interesting intersections of Linux and BSD development. OpenRC’s development history, portability, and 2-clause BSD license make its integration into TrueOS an easy decision. Now that we know a bit about what it is, how does it behave differently than traditional RC? One of the prime benefits of OpenRC is much faster boot-times, which is important in a portable world of laptops (and desktops as well). But service monitoring and crash detection are also important parts of what make OpenRC a substantial upgrade for TrueOS. Lastly people have asked us about migration, what is done, what isn’t? As of now almost all FreeBSD base system services have been migrated over. In addition most desktop-facing services required to run Lumina and the like are also ported. We are still going through the ports tree and converting legacy rc.d scripts to init.d, but the process takes time. Several new folks have begun contributing OpenRC scripts and we hope to have all the roughly 1k ports converted over this year. This distro is designed to replace high end routers, like those from Cisco and Juniper, with FreeBSD running on regular off-the-shelf server. No news is good news. When there is bad news, error messages should be descriptive, and ideally tell the user what they might do about the error. Have you ever had to try to strip out useless output so you could feed that data into another program? It goes on to make an analogy about Public Address systems. If too many unimportant messages, like advertisements, are sent over the PA system, people will start to ignore them, and miss the important announcements. An interesting article floated across my news feed a few weeks back. It’s what essentially boils down to a book called the “Tao of tmux”, which immediately piqued my interest. My story may be similar to many of yours. I was initially raised on using screen, and screen only for my terminal session and multiplexing needs. Needless to say, this article has been bookmarked, and I’ve started digesting some of it, but thought it would be good to share with anybody else who finds them-self in a similar situation. The book starts off well, explaining in the simplest terms possible what Tmux really is, by comparing and contrasting it to something we are all familiar with, GUIS! One of the things the author does recommend is also making sure you are up to speed on your Terminal knowledge. Before getting into tmux, a few fundamentals of the command line should be reviewed. Often, we’re so used to using these out of street smarts and muscle memory a great deal of us never see the relation of where these tools stand next to each other. Seasoned developers are familiar with zsh, Bash, iTerm2, konsole, /dev/tty, shell scripting, and so on. If you use tmux, you’ll be around these all the time, regardless of whether you’re in a GUI on a local machine or SSH’ing into a remote server. If you want to learn more about how processes and TTY’s work at the kernel level (data structures and all) the book The Design and Implementation of the FreeBSD Operating System (2nd Edition) by Marshall Kirk McKusick is nice. In particular, Chapter 4, Process Management and Section 8.6, Terminal Handling. The TTY demystified by Linus Åkesson (available online) dives into the TTY and is a good read as well. From here the boot/article takes us on a whirlwind journey of Sessions, Windows, Panes and more. Every control- command is covered, information on how to customize your statusbar, tips, tricks and the like. There’s far more here than we can cover in a single segment, but you are highly encouraged to bookmark this one and start your own adventure into the world of tmux. A public access UNIX system, it was many people’s first access to a UNIX shell. In the 90s, Virtual Machines were rare, the software to run them usually cost a lot of money and no one had very much memory to try to run two operating systems at the same time. This is how I first started with UNIX, eventually moving to paying for access to bigger machines, and then buying my own servers and renting out shell accounts to host IRC servers and channel protection bots. The guide will then walk us through the process of fetching the Linux runtime packages, extracting and then enabling bits such as ‘procfs’ that is required to run the Linux binaries. FreeBSD: Atheros AR9380 and later, maximum UDP TX goes from 250mbit to 355mbit.